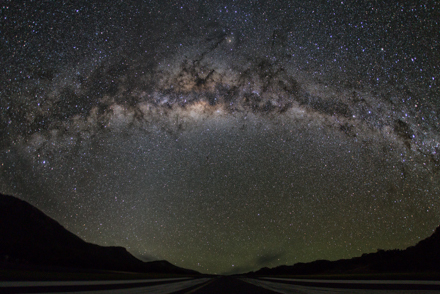 The bimarathon combines aspects of both the Messier marathon deep-sky astronomy observing challenge and a regular running marathon (42.195 km). Because not all of the objects on the Messier marathon list can be observed in one night from most locations in the world, the bimarathon does not require using the Messier objects for the observing portion. A bimarathon instead requires observing 110 deep-sky objects of the participant's choice. The Concise Catalog of Deep-Sky Objects is a natural place to choose the 110 objects from. The bimarathon was conceived by Warren Finlay during discussions with his wife as well as fellow amateur astronomers Luca Vanzella, Alister Ling and Kent Martens. Warren Finlay's target list included all the Messier objects excluding M 30. As a fitting tribute to the bimarathon concept, he instead substituted the aptly named Running Man Nebula (NGC 1973-1975-1977) rather than including M 30 for his 110th deep-sky object. He also observed 7 "insurance objects" that he had selected in case cloud or unfavorable observing near the horizon interfered with finding 110 objects. His insurance objects were NGC 457, NGC 663, NGC 752, the Double Cluster (NGC 869/884), Stock 2, Omega Centauri, and NGC 3384, making 117 objects successfully observed the night of March 9/10, 2016. Finlay had initially planned to observe from the summit of Haleakala (Maui, Hawaii) that night, but a forecast of high winds for the summit, as well as serious concerns about altitude sickness when attempting to run a marathon at 10,000 feet without altitude acclimatization, scuttled this plan. The day of his bimarathon, he instead chose to attempt it at La Perouse Bay, Maui. 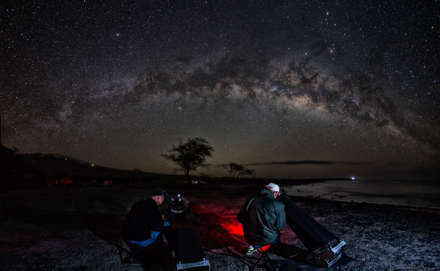 Starting at sunset (approximately 6:30 PM local time) March 9, 2016, Finlay began running and interspersed 6 running sessions with 5 telescope/binocular observing sessions, running a distance of 42.2 km (26.2 miles) and observing the required 110 deep-sky objects (plus 7 bonus objects) before local sunrise on March 10, 2016. He finished running at 6:09 AM, successfully finishing his bimarathon about a half hour before sunrise. He observed approximately half of the deep-sky objects in a manually operated 10" Dobsonian telescope with a 1x red dot finder, without setting circles, drive, goto or any other electronic features. He observed the remainder of the deep-sky objects with 8x42 binoculars, except for a handful of objects (e.g. M 45, M 24, and M44) that he observed naked eye. He was joined by fellow amateur astronomer, Luca Vanzella, serving president of the Edmonton Centre of the Royal Astronomical Society of Canada. Vanzella himself successfully observed the same list of deep sky objects that night and kindly guarded Finlay's gear while Finlay completed his running sessions. A more detailed description of the first bimarathon is given in “A Truly Celestial Marathon”, Stardust 63(9):6-8, May 2017. A short documentary about the first bimarathon can be viewed below.